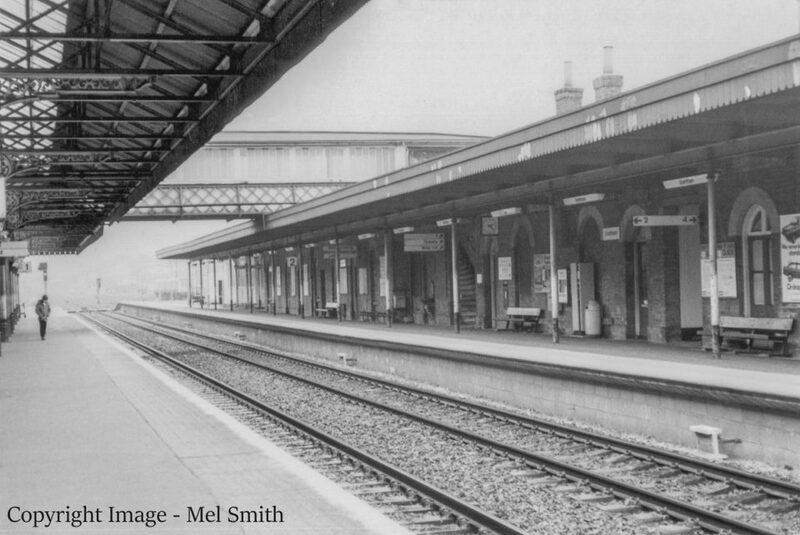 This is a photographic record of the main station buildings recorded in the late 1970s and early 1980s before there were any major alterations to the station. Sadly just a few years later, in the autumn of 1985, all of the Victorian buildings on the down side of platforms 2 and 4 were demolished. The buildings that currently stand on these platforms were constructed to replace them. At this time the footbridge straddling the mainline and connecting platforms 1 and 2 was also completely rebuilt and now incorporates a lift. By the time these pictures were taken the bay platform on the "Up" side, formerly platform 1, was already out of use. The remaining platforms, previously platforms 2 to 5, had been renumbered 1 to 4. So have a wander around the station to see what things were like during this period. The survey is presented in six separate image groups all linked together for ease of navigation. We start on the eastern side of Station Road and will work our way through each platform finishing on the western side of the station on Platform 4. Within each image group you will notice that the sequence moves from north to south as we look at individual groups of buildings on the way. For those unfamiliar with railway terminology please note that the "Up" side referred to in the text denotes platforms for southbound trains to Peterborough and all stations to London. The "Down" side is for northbound services covering all stations to York and Scotland. As more information comes to light about the changes to some of these buildings we will continue to add and expand on the caption for each picture. If you have any personal memories, images or additional information relating to the station buildings, potentially for use in this section, we would love to hear from you. Please note: Unless stated otherwise all images are Copyright: Mel Smith.